With a Raspberry Pi 2 and a powerful sound card like the HiFiBerry Amp+; together with an SD-Card with Max2Play and a simple WiFi Stick, you already have everything you need together! This small tutorial shows how to easily set up Max2Play to get everything working. You do not need any knowledge of Linux or programming and just 5 minutes of time to set this up! There are various images, all free downloads. The heart of this media center is the affordable but powerful 2B, it can handle multiple audio and video players with its quad core processor and 1 GB RAM. A simple USB-connected WiFi Stick to use as an access point that lets us control the Pi from any device in its vicinity. 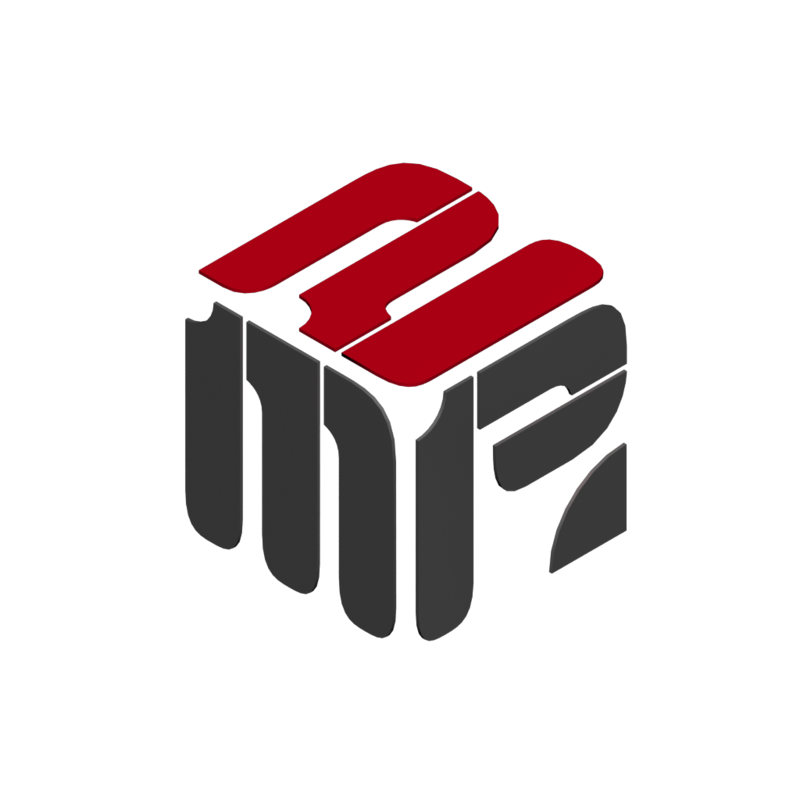 The Linux-based Max2Play image includes the Kodi media center and various audio players and other extensions that can be managed from any web browser. Once burnt, the system works right away and does not require any further configuration. The Max2Play image is perfect to optimize and configure sound cards like HiFiBerry’s DAC+ and Amp+ with just a few clicks. These sound cards can make a huge difference in sound quality for a media center. The images for download on Max2Play are all packed in .rar or .zip files and can be burnt onto a card using a simple tool like the WinDiskImager for Windows. 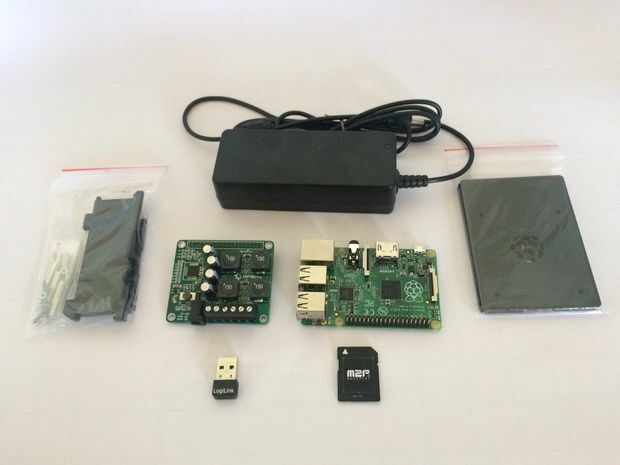 Just let it burn and once the process is done, put the card into the Raspberry Pi. Optional: You can also order an already burnt and configured microSD card from Max2Play. To be able to access our Raspberry Pi from anywhere on the go with our smartphones and tablets, we have to set up an access point with our connected WiFi stick. The Access Point Setup extension is a premium feature on Max2Play, so we need to have an activated account. Once this is the case, we can activate the extension. It is just a web page with a button saying „install“. 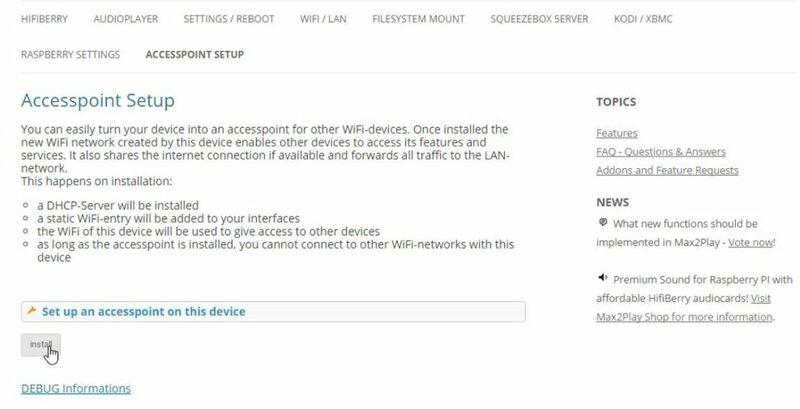 When we click it, the system automatically detects the WiFi Stick and sets it up as an access point for any outside devices. 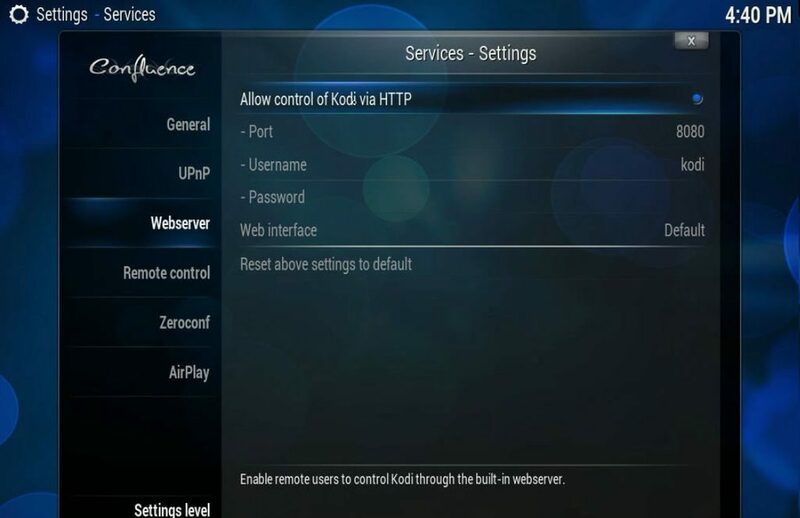 Since Kodi comes preinstalled freely on Max2Play, all we need to do is change a few configurations in its interface to control it from our smartphones. Connected to a screen, we can get the video output from the Pi’s HDMI jack to display Kodi with just a click. There, we need to go to System -> Settings -> Services where we need to tick “Allow programs on other systems to control Kodi” and “Allow control of Kodi via HTTP”. We can also enable AirPlay functionality for our Apple products. 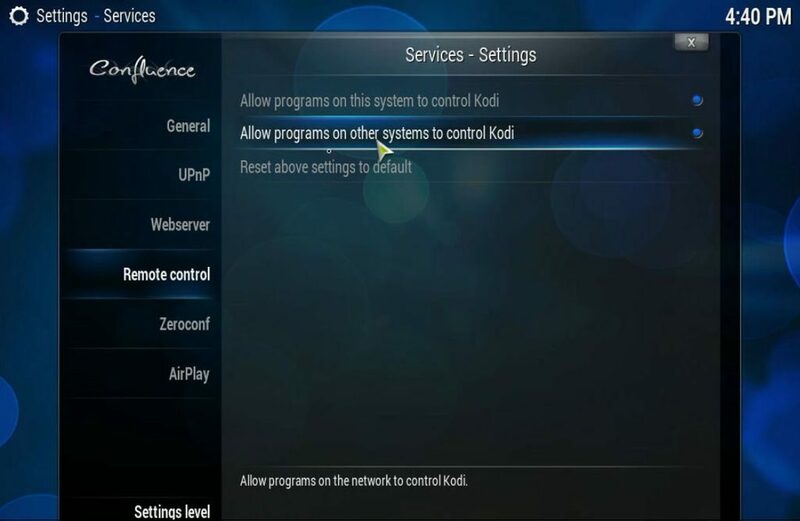 We can now make all our commands to the media center with one of the many great Kodi Apps for Android (e.g. Kore or Yatse) and iOS (Sybu or the official Kodi App). 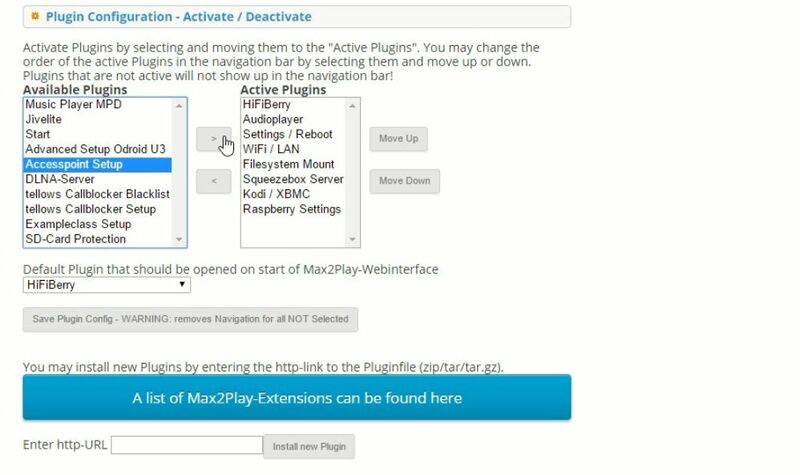 We can also still access our web interface from any device with WiFi and a web browser to change our Max2Play plugins. If the software steps were hard to follow, above is a video showing each step in detail.